The Activity Diagram is one of the Unified Modeling Language (UML) Behavioral diagrams that can be used to model a process or algorithm as a sequence of steps. It is a more sophisticated version of its close cousin the Flowchart diagram. Activity diagrams can be used to model Business Processes as a UML alternative to the BPMN Business Process Diagram and have the same ability to create a hierarchy of Activities in the Project Browser. The elements can be given a name and detailed descriptions can be added to the notes. By connecting the Activities, Decisions and Forks with connectors (Control Flows) a sequence of elements can describe the business process. A process hierarchy can be constructed by nesting Activities in the Project Browser and using the Child Diagram functionality to enable drill down from the value chain level down to the lowest level processes. The Activity Diagram can be used to model any business or technical activity or notion that has a series of steps. This includes business and technical processes and also computer algorithms. The steps are connected by Control Flow relationships that show the sequencing of the steps. Decisions and Merges can be used to model choice and to further control the flow through the Activity. 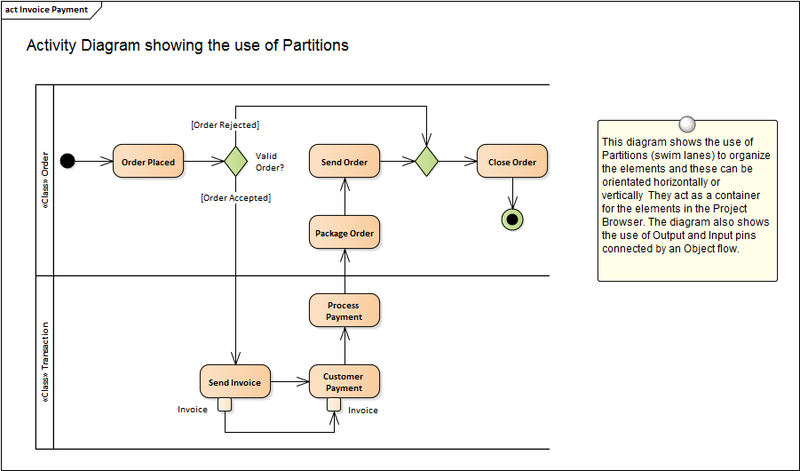 Forks and Joins can be added to split and reunite the flow of control and objects added to show how data is supplied and consumed. Activity Diagrams can be drawn at different levels of formality from a Basic Flow Chart style of diagram used to represent a simple Business Process to a sophisticated Action based diagram that can be used to model a complex system. There is a toolbox which contains a range of elements, relationships and Patterns for creating the models. The Activity Diagram (like any diagram) can be viewed as an element list, which makes working with the element's properties easier.